Whether you are in pursuit of a small token or a grand gesture The Study is here to help you find a unique and fitting gift. Choose from an impressive selection of large format bottles, vintage gems, or artisanal spirits. 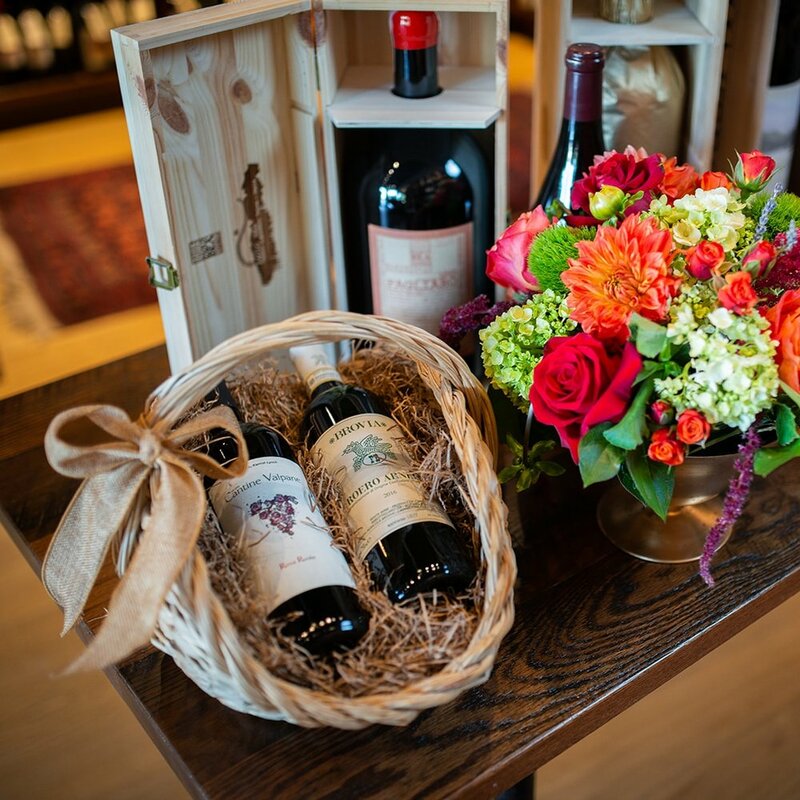 Beautiful gift baskets and personalized cases with hand written notes offer a special way to impress or congratulate. Book a personalized tasting event after hours at The Study or in the comfort of your own home. Katie and Noah provide light-hearted wine education focused on your favorite wine region, grape varietal, category of spirits or other imbibing interests. Expand your palate and wine knowledge by becoming a member of The Study Fine Wine & Spirits Wine of the Month Club. Every month 2-4 wines (generally 2 reds and 1 white) will be reserved for you with tasting notes, history, and food pairing suggestions. As a member you will enjoy a 15% discount on featured wines for that month AND priority seating at The Study wine classes and tasting events. Wine loves food and food loves company. Coming from the restaurant industry, The Study is passionate about the interplay of cuisine and wine and making sure you have the right options for any size gathering. Consider us your personal Sommeliers. After years of collecting, wine club pile-ups and gifts received it can be easy to lose track of the contents of one's cellar. An organized cellar can greatly help you access and enjoy your wines more easily. The team at The Study is available to help asses, document and categorize your wines. This service will allow you to see what to drink, what to hold and highlight areas of interest to upkeep and replenish.